Qualcomm did more than reveal the name of its next SoC, the Snapdragon 835, today at its Snapdragon Technology Summit in New York. It also announced an update to its fast-charging technology. 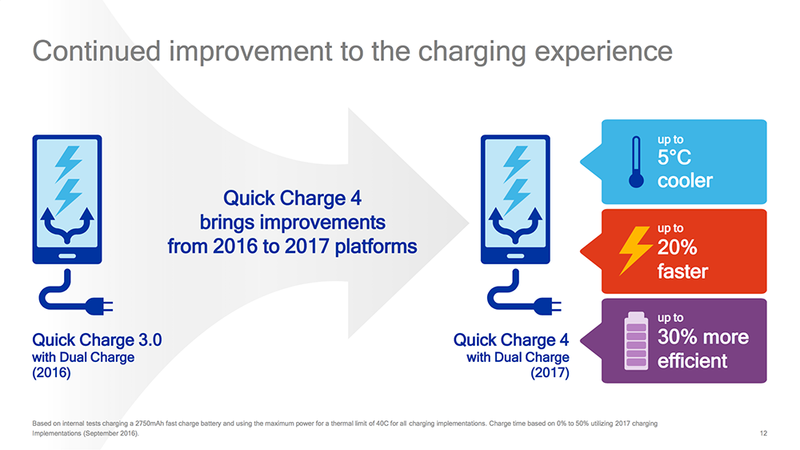 Qualcomm’s Quick Charge 4 promises up to 20% faster charging and 30% higher efficiency than the previous generation Quick Charge 3 found in many current flagship phones. This latest generation brings a number of improvements, but perhaps the most remarkable change is that Quick Charge 4 is now compatible with the USB Type-C and USB Power Delivery (USB-PD) specifications set by the USB-IF standards body. 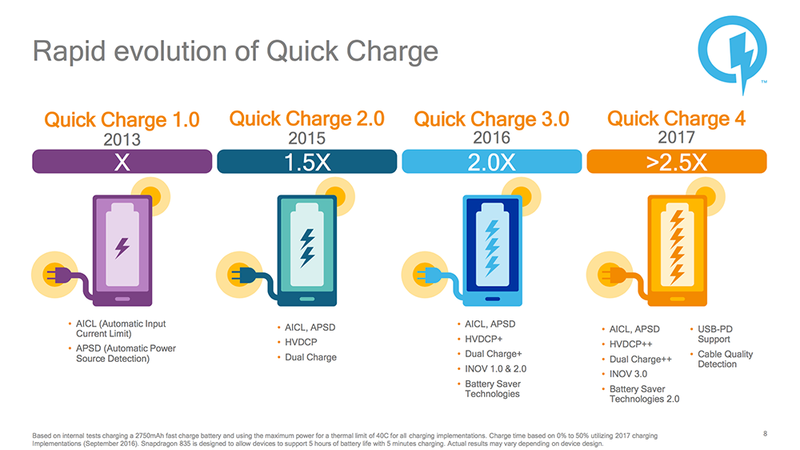 Previous implementations of Qualcomm’s proprietary charging technology alter the voltage delivered over Vbus to increase the charging rate, which violates the Type-C specification for standard charging that only allows for changing the charging current. They also use a different method for negotiating the charging parameters using the USB data lines that runs afoul of the Type-C specifications too. Quick Charge 4 addresses these issues and should satisfy the language Google recently added to its Android 7 Compatibility Definition Document (CDD) recommending device OEMs not use proprietary charging methods that are not compatible with USB-PD. 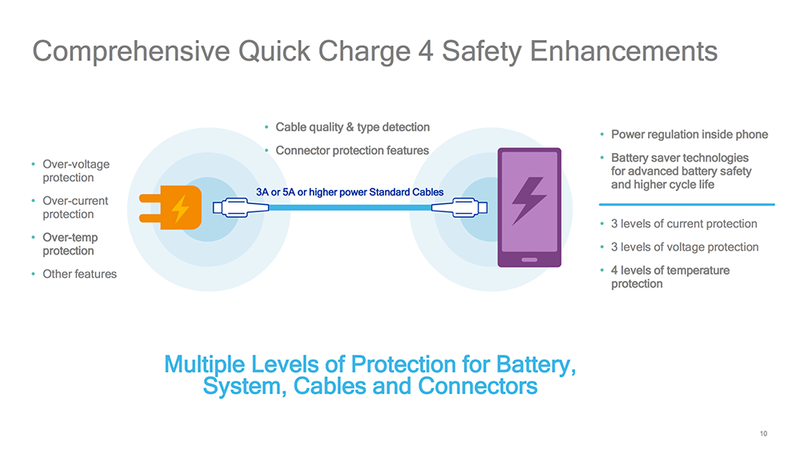 Quick Charge 4 also uses an updated version of Qualcomm’s INOV (Intelligent Negotiation for Optimum Voltage) power-management algorithm that now includes real-time thermal management to help optimize power transfer. It also uses an updated version of its Battery Saver Technologies that uses stepwise charging to help the battery maintain at least 80% of its original charge capacity after 500 charge cycles. Qualcomm’s Quick Charge 4 will be available on devices using the Snapdragon 835 SoC and its two new power managements ICs (PMICs), the SMB1380 and SMB1381. The two PMICs work in tandem as part of the Dual Charge++ feature for improving efficiency, reaching 95% peak efficiency at 3A. The PMICs will be available by the end of 2016 and will be integrated into devices shipping in the first half of 2017.